I was asked tonight where I find inspiration and I answered everywhere and that is the truth. 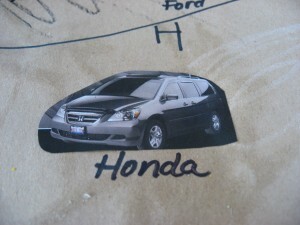 My son is so into car models right now, it all started with him noticing the H on a friend’s Honda and slowly it’s developed into a chorus of ” Honda! Chevy ! Audi! BMW! Toy-woda!” every time we drive anywhere. I decided to harness that and work in some phonics. To say he had a blast is a massive understatement.This would make a great group project too! Gather your materials. 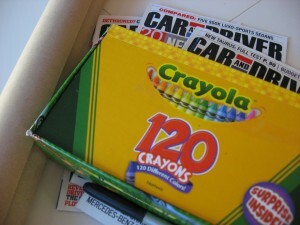 You will need a car magazine , some craft paper( or any large piece), a marker, some crayons, scissors and a glue stick. Start by drawing a road on your paper. 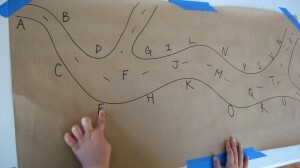 Add the alphabet with your child, have them tell you what’s next after you write each letter if they are able. Hand them the crayons and have them decorate the road- we kept it simple with grass, yellow markings and black for the road. There is no wrong way to do this. 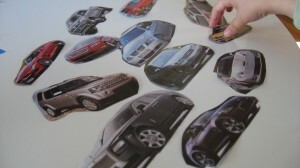 While my son did that I ripped some pages out of the magazine looking for different makes that start with different letters (Audi, BMW, Ford, Honda…) If your child is able to have them search . My son refused to let me do this alone, but he was searching only for Hondas. 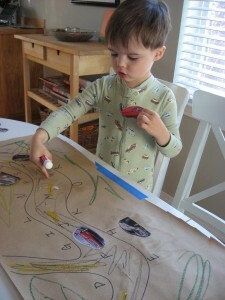 When I had enough I cut the cars out more carefully. While I did that I handed my son some of the discarded pages for him to practice cutting too, his cutting skills aren’t fine tuned enough yet and if I had given him a car to cut out, it would have been pure frustration , but he felt included by cutting the scraps. Time to glue them on. Choose a car, identify it and identify which letter it starts with. 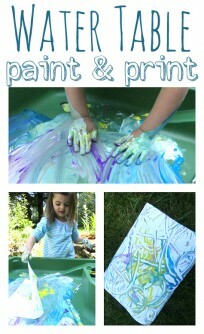 If your child needs some help here is what I did. My son had issues with was I for Infinity. When he did I repeated the sound and said ” like Igloo” by giving hints he was still able to figure it out himself which for most almost 3 year olds is key to their pride. With children who are not identifying sounds yet, tell them which letter it starts with and have them find it on the page. Find the letter on the page. Repeat with all the cars. When all are glued on go through them again and label them with their names. 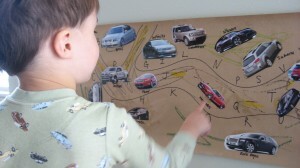 After I taped it to the wall he picked out a car for me, a Mercedes! Good boy! Little Red Car is one of my most viewed song videos click here to watch it ! 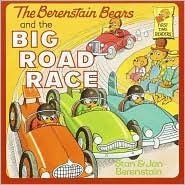 “The Berenstain Bears and the Big Road Race” by Stan and Jan Berenstain shouldn”™t be overlooked. 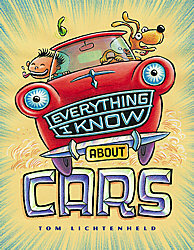 Both my son and i really enjoy this book from the ever popular series. It”™s a good story about being persistent and they sneak lots of learning into the rhyming text. Colors, opposites and more can be reinforced by this retelling of the classic tale of the tortoise and the hare. The author had me at zoomy things. My son only made it through the first few pages, but I couldn’t wait to open it back up after he was asleep. 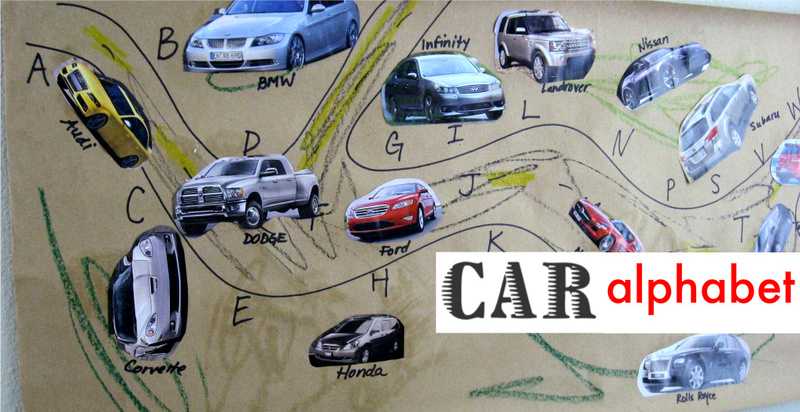 The book takes the readers through the history of cars ( totally made up) , the basics of road trips, kid designed cars … and ends with a tutorial on how the reader can draw their own made up car. I really liked this book and plan to buy a copy for my 4and 7 year old nephews who will love the humor ( yes some of it is pottyish but still fun) and the illustrations. 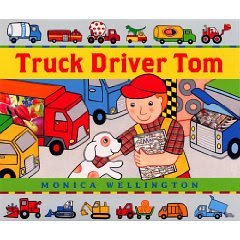 ” Truck Driver Tom “ by Monica Wellington is one of my son”™s picks. The story is simple, Tom and his puppy drive produce from the farm to the market and see the country side and much more along the way. The best part of this book are the fun bright and detailed illustrations, there is a wide variety of trucks, cars , emergency and construction vehicles! Also it”™s a great lesson about how our food gets from the farm to us. 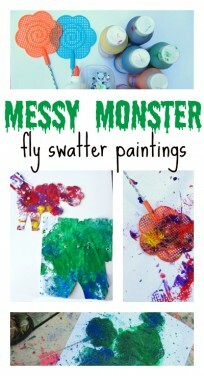 This author is one I have only discovered since becoming a mom and really wish I had been familiar with her while I was teaching, her books are perfect for 2-5 year olds. 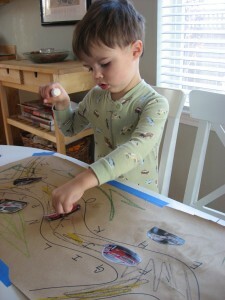 My son is really into construction vehicles… he would love this activity with photos of them! .-= Heather – Dollar Store Crafts´s last blog ..Make a Calavera Skull Centerpiece =-. I love it. My kid is ambivalent to cars, but I could see this translating into something else- foods, clothes, sports teams jerseys. Love it. .-= Stefanie´s last blog ..Trees Enviro-Lunch Set =-. I love your website. I have used so many of the ideas. But, where oh where is your index?? I can’t find anything anymore. If I use your search on the left sidebar it takes me to a list of all kinds of great things that have nothing to do with what I asked for. For example, I typed in “Farm” and it pulled up everything from holiday gift ideas to books about dad. Help. Maybe you just don’t have anything under the label of farm. I am still working on it . The Migration from Blogger to WordPress is not 100% complete, so sorry! If you go to Crafts on the menu bar – the drop down menu will appear. And you can click on crafts by theme- I have many listed already. Until then look at the right hand side bar , all the categories are listed there. I hope that helps in the meantime until we are better organized! I love it! 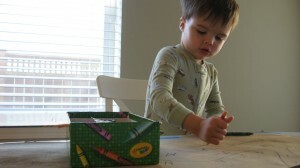 Great idea to work on the alphabet and enjoy Daddy’s old magazine! .-= mamasapplecores´s last blog ..camera eye of a 3 year old =-. .-= Katie L.´s last blog ..Breck Says the Darndest Things =-. .-= Beverly´s last blog ..Wordless Wednesday! =-. My little car lovers would love this idea! Thank you for sharing! I think it’s just great that you involve him so much, and are so aware of his needs, yet also know his limitations. 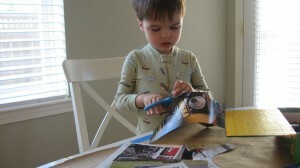 From the pictures, it’s clear that he is having a good time, getting a chance to learn to manipulate tools and having fun learning to read. You have figured out the right way to access his intellect. Keep up the good work! It is an amazing idea. 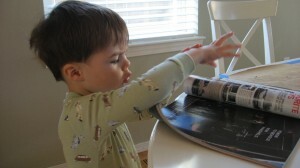 I used to throw away the car magazine but definitely I will use it for my kids. Mate really a good idea.